This is the third in a series about the issue positions of candidates in District 1 based on the debate hosted by Friends of White Flint. Today’s topic: what do the candidates think about the Montgomery County Department of Liquor Control’s alcohol monopoly? Bringing levity to the debate on several occasions, Pete Fosselman started by bluntly stating “I like my liquor” to laughter from the crowd. He proposes letting the county retain control of hard liquor but privatizing the sale of beer and wine, arguing that the change would boost in Montgomery restaurants. As an industry that makes most of their money on alcohol sales, they watch this aspect of the business carefully. Meredith Wellington agreed with Friedson, saying thoughtfully that the monopoly is a symptom of the county’s problematic approach. Arguing that government can’t do everything, Wellington said that we want entrepreneurial people in the county and need to work with them to help us market the county to businesses. Though concerned about losing the union jobs, Reggie Oldak also thinks the county should not be in the liquor business, pointing out that $30 million is not much in a $5.5 billion budget. She shouldn’t worry so much. Private liquor distributors are also unionized. Why should the county should favor jobs with one union over another? Bill Cook believes that privatizing the liquor industry would be a huge loss for the county because we’d lose $30 million and those “great paying union jobs.” Taking perhaps an unusual tack, he then proceeded to attack of his own potential constituents, Total Wine Co-Owner David Trone, who lives and has located the headquarters of his business in District 1. Stating that there is “nothing wrong” with the county selling liquor and endorsed by UFCW 1994 MCGEO, Ana Sol Gutiérrez favors modernization, not privatization. She says that “significant steps have been taken” in terms of improvements. I wonder if she also thinks Metro escalators rarely break down. Gutiérrez likes that we can take on new debt by bonding the revenue stream. In other words, the county is fiscally hooked on alcohol. Jim McGee opposes privatization but favors modernization. Unfortunately, that has been promised for years but is much like waiting for Godot. They say that it’s coming. But when is it coming? At the same time, McGee thinks it is too hard for microbreweries to distribute their product. Clash on the Issues, Part II: is Ballooning Debt a Problem? This is the second in a series about the issue positions of candidates in District 1 based on the debate hosted by Friends of White Flint. Today’s post looks at whether the candidates are concerned about the share of the county budget going to service debt, which is approaching 20% according to the question. Ana Sol Gutiérrez doesn’t see County debt as a problem and views it is analogous to a home mortgage, leaving me hoping that we don’t end up under water like so many home owners. She has confidence in analyses showing the county is financially stable but also expressed interest in finding “other funding streams,” which sounds like taxes. Throughout the debate, however, she referred to mysterious state-level funds that the county had left untapped, a perplexing claim from a this long-time delegate on the appropriations committee who should be well placed to direct funds to the County. In a similar vein, Bill Cook commended the Council for its balanced budget and well-funded rainy day fund, and blamed “reckless” development without appropriate impact taxes for placing additional burdens on county residents. Reggie Oldak took a more centrist position, arguing that too much debt is a burden and Montgomery needs to preserve its AAA bond rating. At the same time, she agreed it is shortsighted not to spend on the safety net, leaving me a bit concerned as debt should go to capital, not operating, expenses. Noting a lot of agreement among the candidates, Jim McGee took a similar position. He views debt as an “investment in the future” but also says we need to see the return on the investment. He also noted aptly that interest rates are rising, so debt will cost more in the future. Economic growth is the real solution to this problem. Meredith Wellington was the first to express directly that she is very concerned about the debt gobbling up more of our budget even as revenues have not bounced back and we’ve raised taxes. She supports the affordability guidelines, even though they constrain the county’s ability to borrow, and said we need to set priorities. In short, Wellington was the first to identify rightly that growing debt and flat revenues is not a sustainable fiscal path, and that the county will have to make real choices as a result. Andrew Friedson concurred with Wellington. He countered Gutiérrez’s home mortgage analogy directly, arguing cogently that we cannot do the equivalent of taking out a bigger mortgage or taxing our way out of it. There is certainly little appetite for increased property or income taxes in Montgomery, especially in the wake of the County’s big tax hike. Once again, voters appear to have a real choice, as candidates expressed broad differences on both debt as a problem and the solutions. All should be concerned with the county bond rating because lower bond ratings mean we pay more in interest and can afford less. As Wellington identified, and Friedson and Fosselman agreed, we are not on a sustainable fiscal path, so debt should be a real concern. The era of difficult choices is far from over. Ana Sol Gutiérrez for Senate? In his analysis of the Montgomery County Council District 1 race, Adam Pagnucco pointed out correctly that Del. Ana Sol Gutiérrez (D-18) is completely outclassed on the fundraising front. She is unknown in much of D1, as the great majority of it is outside of District 18. Moreover, the portion of D18 that is Ana’s strongest base, though not her Chevy Chase home, lies outside D1. Adam speculated that Ana might drop back to the delegate race. I suspect not. At this point, I imagine that she might prefer to retire or at least to go out in a long-shot race that gives her a better platform for her issues, especially on immigration and progressive policies designed to help poor and working Montgomeryites. Even taking this into account, the D1 Council race is a poor choice. This is a crowded contest with several highly qualified, well-funded candidates, so candidate debates may end up being more like those in a delegate contest. Additionally, even some of her usual supporters within D18 have decided to support other candidates rather than Ana’s surprising bid. It’s also just a bad fit. Over the years, Ana has made little bones about her lack of interest in the local concerns of D1 residents. D1 residents are very pro-immigrant but there are a lot of local issues on which Ana has visibly little passion. The rationale for electing a councilmember who emphasizes immigration, as a glance as Ana’s twitter feed reveals, is not high because Nancy Navarro has occupied that niche and this is simply not a contested issue on the strongly pro-immigrant county council. The barrier is not that Ana is Latina in a predominantly white district. African-American Craig Rice represents the whitest district in county and has no problem being simultaneously a proud African American and a strong local advocate. The idea that elected officials must match the predominant race or ethnicity in a district is grotesque. Nevertheless, as in her quixotic congressional bid two years ago, Ana is destined to come towards the back of the pack in this group of candidates. She lacks the resources, the name recognition, or the strong rationale that would propel her candidacy forward. If Ana wants a platform, she’d be better off taking a flyer on the D18 Senate contest for a number of reasons. Unlike on the Montgomery County Council, there is a real niche to fill in the Maryland Senate. Sen. Victor Ramirez is leaving the Senate to run for State’s Attorney in Prince George’s. The Senate will lose one of its strongest advocates on immigration and sole Latino voice. Though Maryland voted strongly for the Dream Act, immigration is contentious at the state level with Gov. 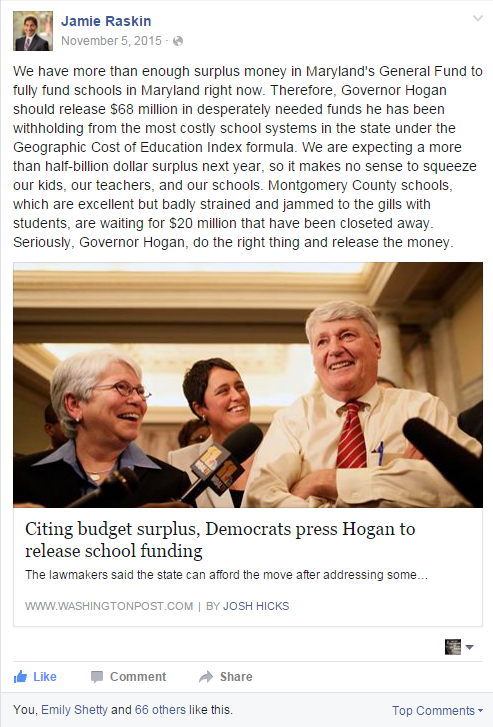 Hogan more willing to make Trump-like noises on this issue than others. Ana has already represented all of D18 for years and done well in delegate primaries. Though Jeff Waldstreicher spent far more money and campaigned far harder in 2014, he received only 122 votes more than Gutiérrez. In 2010, Ana beat Jeff by 483 votes to come in an easy first place. Ana and Jeff ran on a slate together in these elections, so it is hard to gauge their individual support. Jeff campaigns much harder but Ana has a real following. She does well especially in the Wheaton and Silver Spring portions of the district but also gathers many votes near her Chevy Chase home. If Ana ran, there would still only be three candidates in the race, which would prevent her voice from being crowded out. A conviction politician unafraid to stand up for what she believes, she will stand out. Moreover, her entry would completely scramble efforts by Jeff Waldstreicher and Dana Beyer fight to claim the progressive mantle. Entering this race wouldn’t destroy any relationships. It is well known that Gutiérrez is no fan of her colleague, Del. Waldstreicher. I don’t know how she feels about Beyer but she supported Rich Madaleno steadfastly when Beyer challenged him four years ago. Waldstreicher and Beyer will both run expensive, hungry campaigns. However, that leaves Gutiérrez able to position herself as more grassroots candidate who can’t dump thousands of her own money on a campaign like Beyer and is not beholden to the donors who Jeff has pursued with vigor. However, she’d need to cultivate local support, especially since Jeff positions himself as a good constituency service politician. While most endorsers will overlook Gutiérrez for the D1 Council race, she would have to receive serious consideration in D18. Despite being way behind in the fundraising, she would have a shot based on name recognition alone. Endorsers would also have to explain why they are overlooking the more senior female delegate to endorse the younger Waldstreicher. Unlike in past D18 races, the Purple Line should not be an issue. In previous elections, there was no “right” position on the Purple Line in D18, as supporters and opponents both have prospered. (I was a strong opponent but now hope it goes well since we’re about to spend billions on it.) Ana gained friends as a steadfast supporter. Jeff and Dana’s positions are both more complex. Jeff positioned himself as an opponent but my conversations with people on both sides of the issue reveal that he bent over backward to curry their support without altering his public position. Pro-transit groups accused Dana of being opposed to the PL despite her statements of support. As a result, neither Jeff nor Dana gained allies from either supporters or opponents. Regardless, to the extent it matters, it feeds the narrative of Ana as an authentic, conviction politician among both voters and, more importantly, among candidate validators and endorsers. My guess is Ana sticks with the D1 race. I haven’t asked and she certainly doesn’t look to me for advice. But if she switches horses, it would be far more interesting if she ran for Senate than sought another term in a crowded contest for the House with no incumbent slate. Though it would be a tough race and both Waldstreicher and Beyer possess real strengths in terms of money and drive, there is a path in D18 for Gutiérrez that just doesn’t exist in the D1 Council race. Note: At various times, I have supported and given donations to Beyer, Gutiérrez and Waldstreicher. I have not donated or supported any of their campaigns this year. All Politics is Local . . . Right? Today, I’m pleased to present a guest post by Adam Pagnucco. “All politics is local” according to the famous quote by former U.S. House Speaker Tip O’Neill. Moreover, any occasional viewer of Hardball, the MSNBC politics show featuring his former Chief of Staff Chris Matthews, can probably hear the host’s voice repeating it over and over. In fact, he actually titled an entire chapter of one of his books with that phrase and explored its meaning in detail. So who would disagree with this hallowed political wisdom? Apparently, none other than Chris Matthews’ wife and current candidate for Congress in District 8, Kathleen Matthews. Kathleen Matthews is a formidable candidate with many strengths. She has name recognition from her long-time career as a local news anchor that would make most candidates green with envy. She’s great on TV and radio. She’s smart, well-spoken and attractive. She raises all the resources she needs to win. And she is a female candidate running against a group of mostly men, which is a plus in a Democratic primary tilted heavily to female voters. But her campaign is so generic that it would be equally applicable to someone running in California, Massachusetts or New York. The problem is that there’s almost no locally relevant content to go along with it. It feeds the vibe that her campaign is planned and executed by national-level, D.C.-connected operatives with no understanding of Montgomery, Carroll and Frederick Counties. And this is particularly surprising given the fact that Kathleen Matthews covered local issues as a journalist for twenty-five years. Want to go local? Here’s how. 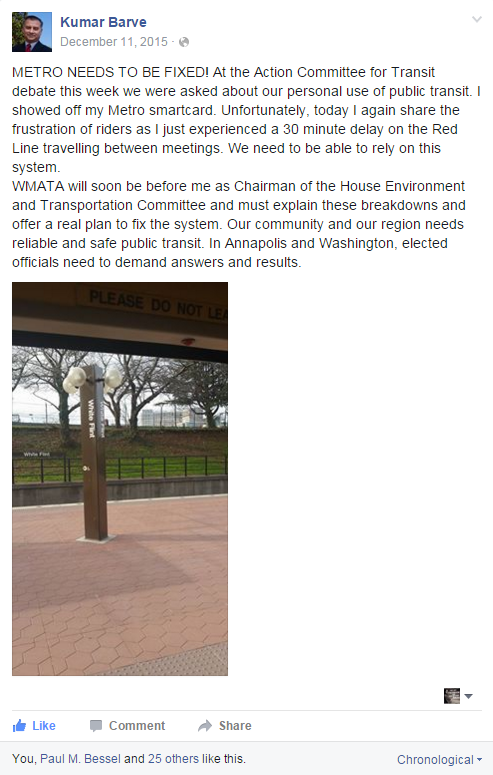 It’s impossible to understate the frustration that Metro riders have with WMATA. And how can one miss the drumbeat of local press coverage–assuming that one actually READS local press coverage? Riders want a fix and Members of Congress can play a big role. But Metro is buried in the Environment section of Matthews’ issues page. Transportation and education have been the two most important issues in Montgomery County since, well . . . no one here remembers when they weren’t the Big Two. But Matthews’ issues page has no transportation section. All of the key transportation solutions on the table required big federal bucks: the Purple Line, getting money for the Corridor Cities Transitway, remedying congestion on I-270, dealing with the American Legion Bridge and getting financing for Montgomery County’s proposed bus rapid transit system are all appropriate issues for federal involvement. This issue is both national and local and it is another no-show on the Matthews issues page. Many CD8 communities, including Takoma Park, Silver Spring and Wheaton, are filled with first- and second-generation immigrants of many nationalities. Barve and Delegate Ana Sol Gutiérrez are talking about this a lot and most CD8 candidates are addressing it. Is Matthews? There are ways to talk about national issues while rooting them firmly in local affairs. Take a look at Senator Jamie Raskin’s issues page. He touches on many of the same matters as Matthews, but he discusses them in Maryland-specific terms while touting his specific accomplishments. Here are two more examples of Raskin discussing education and the environment employing a local frame. Whatever one may think of Raskin, he is definitely running in Maryland! This is Raskin’s great strength. His campaign has deployed one of the best local field operations in recent memory and openly brags about its success. Raskin’s supporters extend beyond the establishment types (who can sometimes be a mixed blessing) and go down into the ranks of grass-roots activists–the kind of people who provide ground energy for campaigns. Some of his solicitations have so many names on them that even the most diligent reader can’t make it to the end. Does the Matthews campaign have lists of precinct officials, PTA officers, civic association board members and religious leaders to contact? How many of these local leaders have been asked to meet the candidate? Matthews is by many accounts an impressive person capable of making a good impression. How much is that strength being utilized? 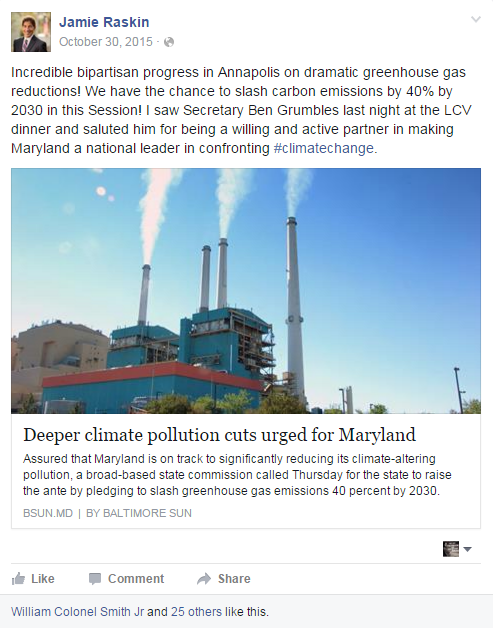 The Annapolis establishment is mostly with Raskin, and the rest of it is with Barve. That’s not necessarily a problem for Matthews, as there is a certain segment of the electorate that dislikes political “bosses” and they respond well to perhaps her most important supporter, Comptroller Peter Franchot. So what does her campaign do? It lumps in news of Franchot’s endorsement with endorsements by two U.S. Senators with no connection to Maryland as well as former Lieutenant Governor Kathleen Kennedy Townsend. Anyone with any knowledge of Maryland politics would know that Townsend was responsible for one of the most humiliating defeats in state Democratic Party history, the loss of the Governor’s seat to Republican Bob Ehrlich, and it all began when unknown retired retail clerk Bob Fustero got more than 20% of the vote in the Democratic primary. The Franchot endorsement is a big deal. It can be used to good effect with fiscally moderate Democrats, especially in Carroll and Frederick Counties, and it can be used to fuel a similar anti-establishment narrative to the one used by now-Congressman John Delaney in 2012. But announcing the Townsend endorsement at the same time sent a signal to anyone acquainted with state politics that Matthews’ campaign has little understanding of our history or current political scene. One more thing. Where is former County Executive Doug Duncan? He may be Matthews’ most prominent local supporter other than Franchot and he has a sizeable following in Montgomery County. He was a key early backer of John Delaney. But he is not mentioned at all on Matthews’ website. Speaking of the Comptroller, he has a knack for latching onto hot local issues that help him build his base. For example, what do air conditioners in Baltimore County Public Schools have to do with the Comptroller’s core duties of tax collection and regulation of alcohol and tobacco? Absolutely nothing. But Franchot and Governor Larry Hogan are using the issue to bedevil a common adversary, Baltimore County Executive Kevin Kamenetz, and are fortifying their support in one of the state’s key jurisdictions. First, a substantial number of Democrats want the alcohol laws to be reformed. Second, if just one candidate in a multi-candidate race agrees with that position, those voters will flow towards that one candidate and away from the others, creating an advantage. And third, the monopoly’s principal defender, the county employee union, would never endorse Matthews no matter what since there are several other candidates in the field with long pro-labor voting records. So Matthews has nothing to lose and everything to gain. Why not call for Ending the Monopoly and pick up some votes? Look, folks. Kathleen Matthews is a top-tier candidate and she could definitely win. But if she doesn’t, this is why: so far, her campaign does not believe that All Politics is Local. Or really, that Any Politics is Local at All.